Portrait of Vuth Lyno. Photo by Nick Sells. Pen Sereypagna & Genealogy of Bassac, the White Building, 2015. 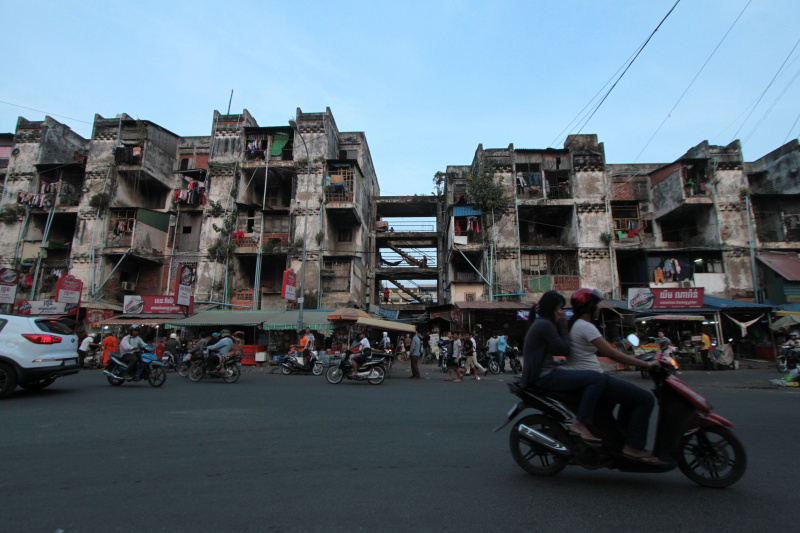 The White Building (or originally known as Municipal Apartments) was built in 1963 as one of the early modern public housing projects in Phnom Penh. It was home to more than 500 families before it was torn down in September 2017 for new development. Photo courtesy Sok Chanrado, 2015. 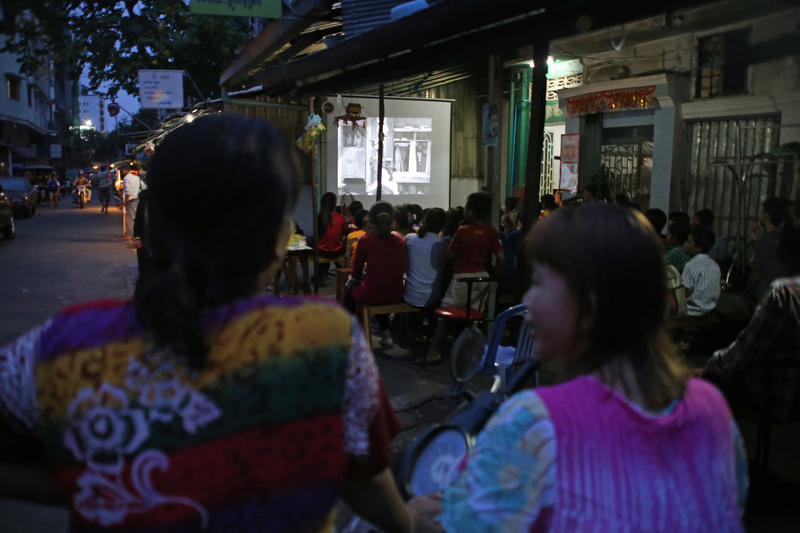 A street-side coffee shop at the White Building was turned into a community theatre screening films to White Building’s children and residents as part of Sa Sa Art Projects’ monthly village cinema program, 2016. Hong Kong artist Ip Wai Lung presenting his work at Sa Sa Art Projects in the residency programme this year. We continue our investigation into the Cambodian art system through the individuals who are shaping its growth. This time, Naima Morelli travels to Phnom Penh to speak with the artist, curator and researcher Vuth Lyno. IMAGES: Courtesy of Sa Sa Art Projects. 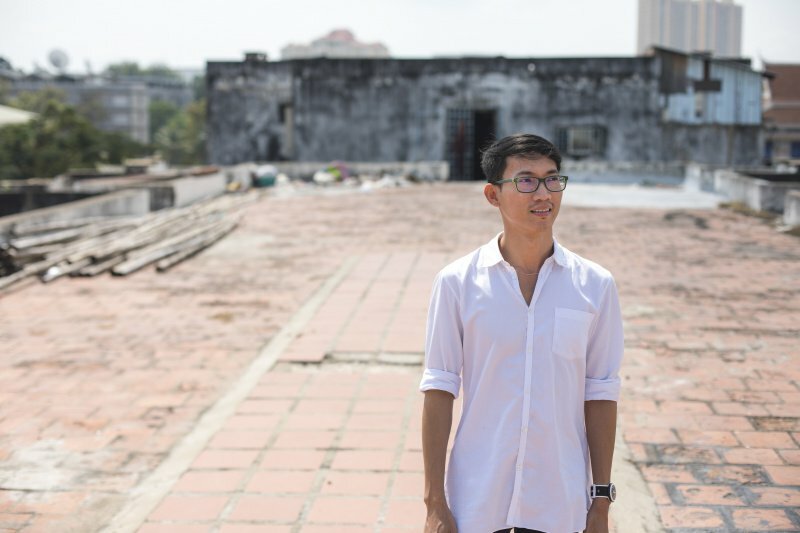 “You need to talk with him, he is super-smart!” That’s what everyone in Phnom Penh told me about Vuth Lyno, the co-founder of the art space, Sa Sa Art Projects. Speaking with him, I realize that the reason for his good reputation is twofold. On the one hand, he cares about the growth of his community, while on the other, he tackles every problem with both a practical and imaginative edge. Most importantly, he is not afraid to break the conventions of the art world. Lyno started off studying and working in Information Technology, Public Communications and International Development. His interest in art came in the form of photography, as part of his job in Public Communications. From there, he decided to further his studies in photography through a course led by the photographer Stéphane Janin, who founded the Popil Photo Gallery (2005-2007). He met a group of driven individuals on this course and together they formed the Stiev Selapak, a group that not only created their own artworks, but also engaged with local artists in the community and educated the new generations through Sa Sa Art Projects. A constant learner, Lyno then decided to study art history in the US. “Even if what I studied was ultimately Euro-American art history, it totally changed my life. It was an interdisciplinary course that linked art history to the social history of art, philosophy, critical theories, history and geography. I was really blown away by how much I learnt during that time compared to my previous studies. Most importantly, the art history that I studied was aware and critical of itself, compared to the field that I had studied before, international development, which lacked self-criticism. It helped me a lot in terms of thinking about art history here in Cambodia, and thinking about the possibilities and approaches for Sa Sa Art Projects. Considering that the Cambodian art system is still in the making, is it possible to create an alternative to the Western model? Definitely. This process of creating an alternative that is true to the Cambodian conditions was started by Reyum Institute of Arts and Culture. It sadly closed in 2009 after operating for 10 years. The founders both shared a commitment to developing art and culture in this country. They chose to locate their space next to the Royal University of Fine Arts (RUFA) and collaborated with them, as well as all of the art shops in the area. 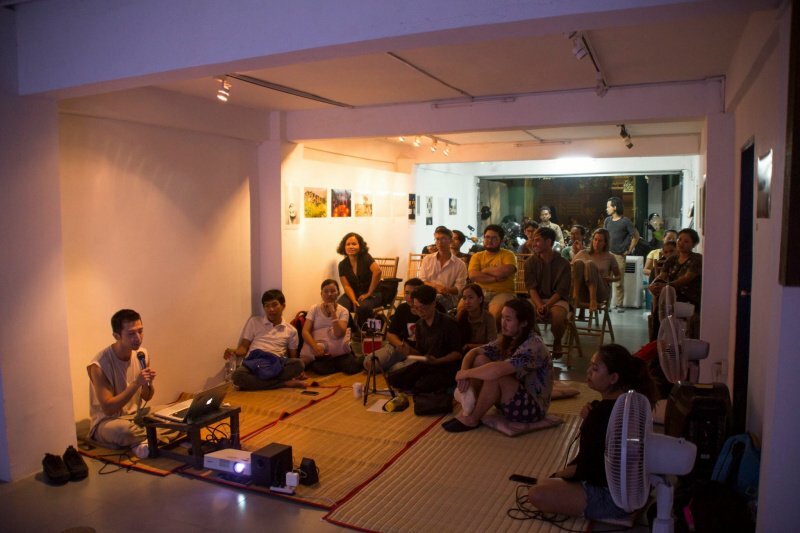 Not only did they engage with art students, lecturers and professors from RUFA through their programs, but they also focused on cultural research and opened up the definition of contemporary art from a local context. That inspired me to think that if something has to be built, it needs to be built from within, from our own existing community. We can then have interaction with the world outside. 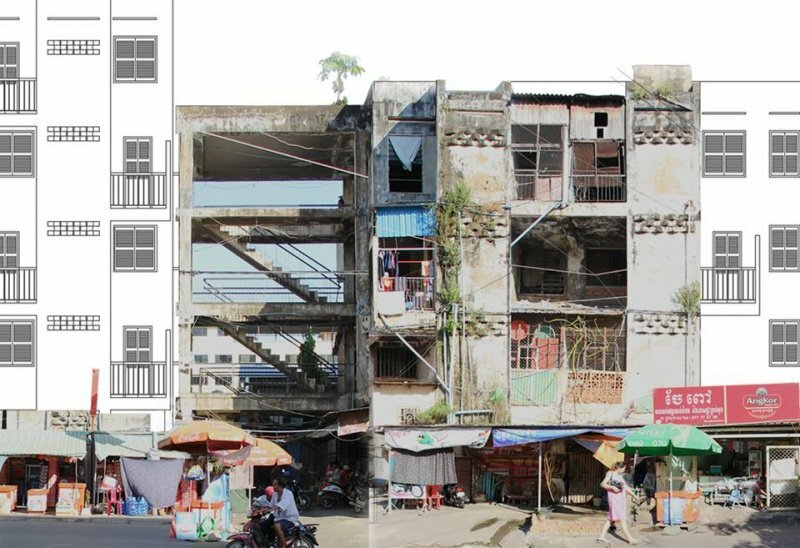 Can you tell us about the strategies that Sa Sa Art Projects has used to engage with the community in Phnom Penh? It started when we were based in the White Building, exploring the possibility of engaging and interacting with everyday people like the building’s residents, who were definitely not gallery-goers. In our efforts to be inclusive, we decided not to operate within a gallery framework, but a project space framework. We were doing everything except exhibitions. We organized events, residencies, workshops and collaborative projects, interacting with local and visiting artists and creative practitioners. We thought about how art could fit the context by utilizing the existing resources and spaces in the neighborhood. We want people to think that they don’t need a gallery to make art. Art can happen in other forms and other ways outside of the conventional exhibition platform. We used the strategy of doing something that was familiar, but also unfamiliar at the same time, which was more contemporary. We didn’t hesitate to stage a series of film screenings that started with Mr Bean and ended with Davy Chou’s Diamond Island. We would get people exposed to different types of moving images without necessarily labeling them as art. What is that the Cambodian art system needs the most right now? What it needs most is the support of young artists and young creative practitioners, including curators. Support means opportunities, residencies abroad, exhibition spaces, exposures, workshops and finance. In many cases, we need to cultivate more leaders in the field. Otherwise, it is always the same few individuals having to wear many hats which disperses their energy. We need to offer space, support, time and patience for more committed individuals to grow. You are definitely juggling several different roles; you started off as an artist, but today you are working more as an organizer, director and curator. How do you manage all these different identities? Having the chance to experience all these roles is a remarkable experience. I think that each one of them has helped my overall practice, and I see them all as being compatible with my vision of fostering a stronger art community here. It doesn’t have to be one or the other. But, of course, you have to spend more time on one thing than another. This is why my artistic practice has been slow for the past few years because of all these other engagements. I missed making art and I’d love to make artworks again. This year has been good for me. I managed to create two new bodies of work. That feeling of being able to create something for myself is incredibly rewarding. I need to remember to balance all of that. I expect to have a manager joining our team soon this year who will help by taking more responsibility from me, so that I can manage the space less and have more time to make my artworks. It seems that Cambodian artists have a hard time taking criticism, as it is not a default cultural attitude for them. Do you think there is some truth in that, and if so, what must be the approach of the curator or art critic in this context? That’s true. I have also seen it from my own experience. In terms of critical feedback, I think people prefer to talk privately, rather than being criticized in the public arena. Another factor is that the community is so small, so there are conflicts of interests. I cannot write a review of some artworks at another space or even write a review about the work that is happening here at Sa Sa Art Projects. I can only write my curatorial text for the show, and try to bring in additional voices. Generally speaking, I think it’s healthier to build a culture of dialogue so that artists can accept criticism, discuss, be critical themselves and give feedback, which is already happening in my own practice in the space. There are times where I clearly feel that I need to step back and let the artist decide. We need to create room for trial and error.